I know that it is important to reply when spoken to. A student says “Good Morning” to me in the crowded hallway and I will generally say “Good Morning,baby” in return. I do this on my auto-pilot setting and may not even know what child it is that spoke. Sometimes they will point this out, “you don’t even know who this is” and my response is generally to stop walking and look to see them and smiles and say “it doesn’t matter sweetie, you are one of mine and you spoke, so I spoke back.” It is important to have these exchanges online as well. That is one of the things that make these challenges work. As a blogger, teacher, mother, father, sister, brother, uncle, student, administrator, etc. we can post and share our thoughts, opinions, resources and have others make acknowledge our efforts. I am trying to do a better job of that online. I do a decent job on Twitter but I must do better on my blog and the blogs of others. 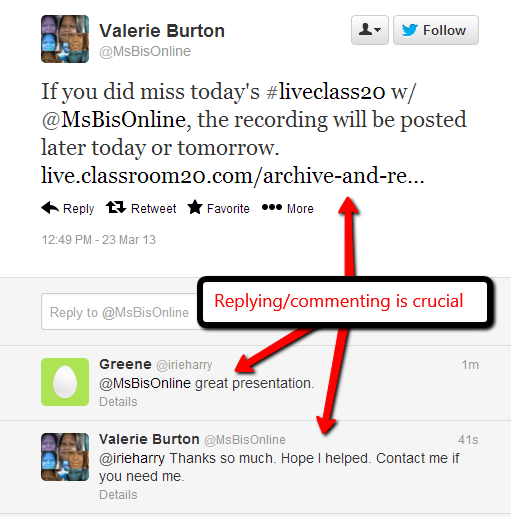 I Tweeted about my Classroom 2.0 presentation and someone replied to my tweet. I immediately replied to their reply thanking them and offering help if needed. Will they contact me again? I don’t know and that is not what is important. What is important is that I took the time to acknowledge their thank you. I am grateful for the comment so I let @irieharry know it. I am trying to block off a part of the day when I merely read and respond to others. Thanks to all of you who do reply and comment regularly. I am stepping up my game from know on. Yes, I am still ‘slicing.’ I knew that posting everyday would be a real challenge but I do want to make sure that when this month ends, I have published 31 posts. That is my main goal. To talk when I have the time and the material. There are days like today and tomorrow that I can easily crank out 1/2 a dozen posts because my mind is “ready to talk.” As I plan, reflect and recalculate me past week or upcoming one. Thanks to the Two Writing Teachers for making me commit to writing and sharing more. This is post 10/31. I only have 21 more posts to go……. Posted on March 23, 2013 by Ms. B.. 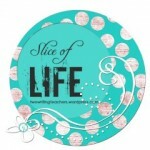 This entry was posted in My Head, My Heart, My World, Slice of Life Series. Bookmark the permalink.